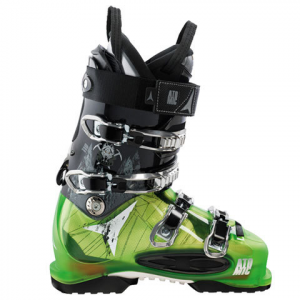 Atomic's Tracker 110 Boot is a backcountry skier's dream. This boot has a stiff fit, with four buckles for plenty of security. The front of the boot is very stiff, so the wearer can control the skis expertly by applying as much forward pressure as needed. At the same time, Live Fit Zones automatically conform to the shape of the foot, allowing the skier have excellent balance and a natural foot position. Although the boots are very stiff, the Live Fit Zones and a Power Control Release prevent pressure sores. When opened, the release gives a wider range of motion for comfortable walking. The range of flex is 18 degrees forward and 2 degrees back for efficient natural movement when climbing in the backcountry. Other specification of the Tracker 110 include a durable 1 mm offset shell, a 98 to 100 mm last and a thick 35 mm strap. The strap provides additional support and helps make the cuff adjustable. An ASY T1 Sport Liner is cozy and warm, and it also conforms comfortably to the foot's natural shape. The Tracker 110 also comes in edgy black and translucent green coloring.